The Merry Cafe stamp set has been so fun to play with! I've created so many projects with it, I could probably post a months worth of projects! But I won't there's so many other great products in the holiday catalogue I want to share with you too. Assemble pizza box by folding along all the score lines. Add a bit of adhesive (I find tear and tape or fast fuse works best) to the back flaps on the bottom part of the box. 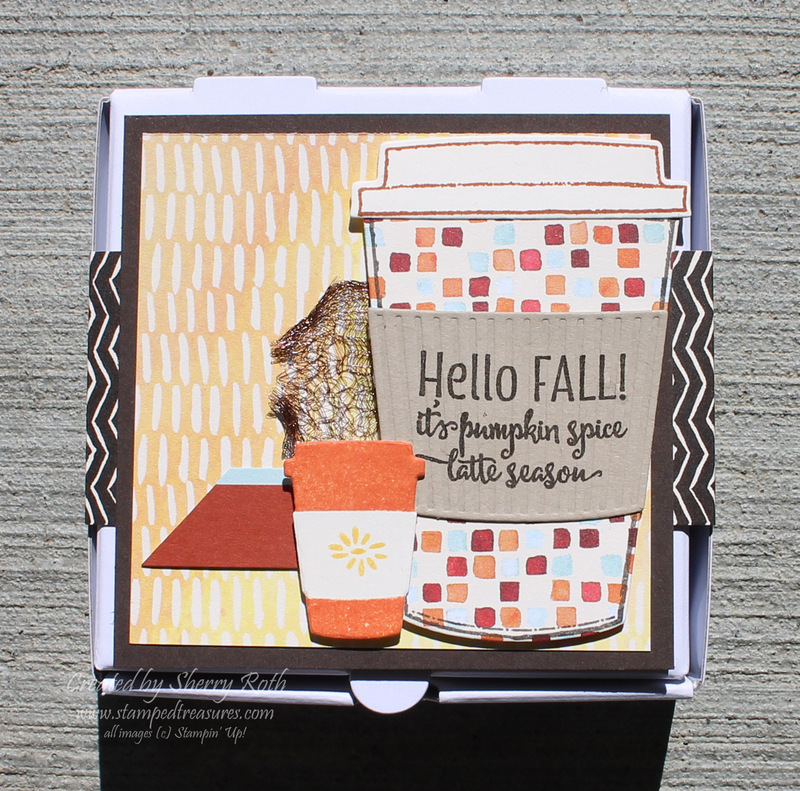 Cut a 1-1/2" x 10-1/2" piece of the Painted Autumn dsp. I used the espresso patterned piece. Place the pizza box in the center of the strip and carefully fold along each side as you fold the dsp around the box. Attach one end of the dsp to the other end at the overlap. This creates a belly band. NOTE: don't attach the dsp to the box. That way the receiver doesn't have to rip into it to get it open. They can just slide the belly band off. Add a 3" x 3" piece of dsp (yellow one was used here) to a 3-1/4" x 3-1/4" piece of espresso cardstock. Add this to the belly band, applying adhesive horizontally across the middle. Stamp the coffee cup using espresso ink onto a piece of dsp (the one with the tiny squares). Stamp the lid using cajun craze ink onto a scrap of vanilla cardstock. Cut both images out using the coordinating framelits. Stamp the Hello Fall greeting with espresso ink onto a piece of crumb cake cardstock and cut out the band using the coordinating framelit. Assemble your coffee cup as shown. Cut a 2" piece of copper trim and spread it apart so that it looks kind of like mesh. Ink up the top and bottom portion of the small coffee cup with tangerine tango ink. I left the Perk Up uninked. Stamp it onto vanilla cardstock. Cut it out using the coordinating framelit. Ink the tiny partial flower with daffodil ink and stamp it onto the band on the mini coffee cup and rotate it 180 degrees and stamp it again to make a full flower. Add a 1/2" x 3" piece of cajun craze cardstock that has been cut at an angle, to the box, about 1/2" from the bottom. Repeat step 10 with a 1/4" x 3" piece of soft sky cardstock. Add the copper trim to the top of the box. Note: I just added a bit of fast fuse to the dsp and stuck the trim on top. Using dimenstionals add both of the coffee cups. These boxes are food safe so you could add some chocolate covered coffee beans, a pumpkin spice cookie, a Starbucks gift card or so many other options! I can't get enough of these little boxes, they are adorable! If you want more ideas on what to do with the Merry Cafe stamp set, be sure to check out the online class below. Do you love stamping, but find you're too busy to attend a class? Do you love to craft at home in your pajamas? Are you looking for creative ideas? Then the Merry Cafe Online class is for you! This class is full of ideas on how to stretch the Merry Cafe stamp set all the way to Valentine's Day! Imagine having 10+ ideas at your finger tips for 1 stamp set! Hesitant to purchase something from me when you don't know what the quality will be like? No worries. Here's a little peek at one of the projects you'll receive. You can view the instructions here and the video here. This is just a sampling of what you'll receive when you purchase the Merry Cafe Online Class. Step-by-step instructions, with measurements for 10 projects (one of which is a fancy fold) all using the Merry Cafe stamp set. Access to recorded videos for the projects that require a bit more explanation. Tips & tricks for creating the projects. Photos of a couple other projects created using the stamp set for even more inspiration. Anyone worldwide can purchase this option. Maybe you already have a demonstrator or are a demonstrator - then this option is for you. Receive option 1, along with all the pre-cut, embossed pieces to create all 10 projects. For this option you will receive the tutorial, the class kit, the Merry Cafe stamp set and a free gift. Receive everything in option 3 plus the Coffee Cafe stamp set and Coffee Cups framelits. By purchasing this option, you are receiving the tutorial and the class kit FREE!! Registration is open until September 22nd.